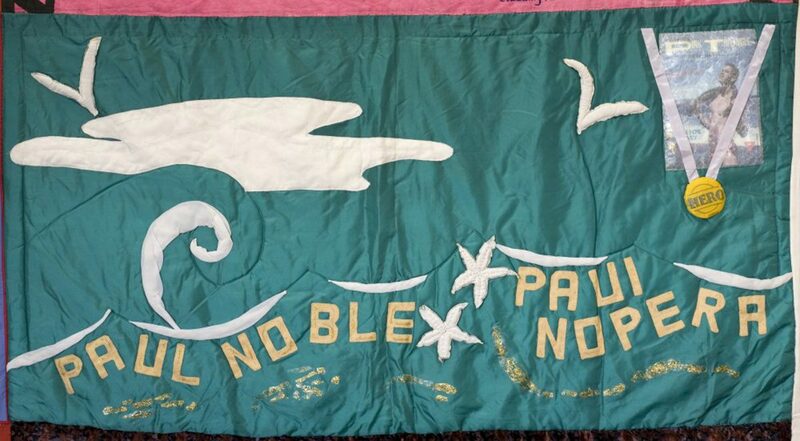 This Quilt is only one of many that it’s makers hope will be used to memorialise the life of Paul Noble. Conceived by two of his friends but worked on by many people, it commemorates the part of his life he chose to spend with gay men. The base colour of the Quilt represents the sea. Paul loved to spend time at the beach or just walking along the sand. The waves, the gulls and the starfish are all part of the environment Paul loved. We have included the cover of a magazine which shows Paul near a Wellington beach. He was chosen to launch the first colour edition of that magazine. This picture shows him as he will be remembered by many people all over New Zealand. The medal that covers this photo commemorates a proud moment in his life. In 1986 he won a gold medal for New Zealand in the shot put when he travelled to the 1986 Gay Games in San Francisco. The medal has been inscribed with one word – HERO. To all of us, Paul was a gay hero and this was recognised when he was chosen to be part of the promotion for the HERO Party in Auckland in 1990. We chose to make the letters of both of Paul’s names from a material which was the colour of the earth. Whatever people may have told of him, whatever magazines may have featured his handsome face and beautiful body, Paul always had his feet firmly planted on the ground. Both of Paul’s names have been included on the quilt. He was born Paui Nopera but chose the name Paul Noble for himself. This was part of his life as a gay man and we have recognised the difference with a little glitter. Paul was a man so sure of himself that a little glitter never bothered him. I was shocked when I saw this after running across your name in a magazine. I had forgotten your name. I also competed in the 1986 Gay Games in Track and Field. I was very impressed with you. I had never met a Maori before. You were so cool. Rick also added a new page for Ricky Valdez who also knew Paul.